FREE dance-fitness quick calorie blast video! 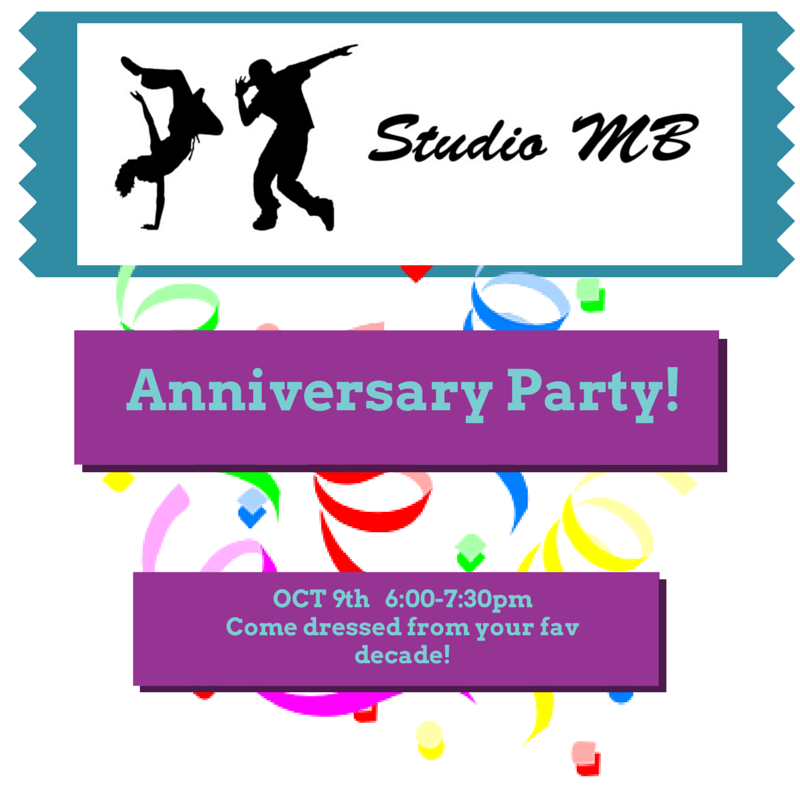 Happy 2 year Anniversary to Studio MB! 2 years. Wow! It is amazing how fast time passes when you’re having fun! I can honestly say that where Studio MB stands today is a dream come true. So much has happened in the last 2 years; adding Belly Dancing classes, the big move..lots of fun memories. I want to thank each and every person who has supported Studio MB through this journey, near and far. You are all greatly appreciated! I’m very excited to see what the future holds and where we’ll be a year from now. Until then, come celebrate this amazing 2 year milestone with us Thursday, October 9th! Doors open at 5:30pm, Zumba starts at 6:00pm. Bring your friends and come dressed from your favorite decade. The playlist will contain popular throwbacks from different decades, as well as some regular class favs. Expect a party atmosphere…Dance lights are back, in an all new way! This is an hour-and-a-half of Zumba you won’t want to miss! Bring your energy and your dance shoes, we’ll see you on the dance floor!! One thing you HAVE TO do to lose weight & KEEP IT OFF for good!